Exit to Airport Roadway, follow signs to Boston via the Sumner Tunnel (toll). Stay to your right and take Rte. 93 N to Storrow Drive. Stay in the right lane and exit to Storrow Drive, after approximately 1 mile on Storrow Drive, exit left for Copley Square. At the end of the exit turn right onto Beacon Street. Travel 2 blocks, turn left on to Clarendon Street, drive straight until 100 Clarendon St. The main entrance to Garage @ 100 Clarendon is located on the right. Take interstate Rte. 93 S to Boston and take Storrow Drive/Leveret Circle exit. After approximately 1 mile on Storrow Drive, bear left and take left exit to Copley Square. At the end of the exit turn right onto Beacon Street. Travel 2 blocks, turn left on to Clarendon Street, drive straight until 100 Clarendon Street. The main entrance t>o Garage @ 100 Clarendon is located on the right. Take interstate Rt 93 N to exit 18 for Massachusetts Avenue. Follow signs off of the exit ramp to Mass Ave. Take a right on Mass Ave. and go through about 8 sets of lights until the intersection with Huntington Avenue. Take a right onto Huntington Avenue. At the Westin hotel , Huntington Avenue becomes Stuart Street. Stay straight at lights at Dartmouth Street. As you approach the second set of lights turn right onto Clarendon Street. The main entrance to Garage @ 100 Clarendon is located on the right. 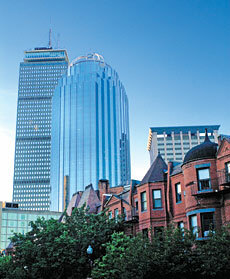 Take the Massachusetts Turnpike Rte.90 east into downtown Boston (toward Central Artery and Southeast Expressway). The Turnpike will become a tunnel under The Hynes Convention Center and Prudential Building. While in this underpass, take exit 22: Prudential/Copley Square, bear right, follow signs to Copley Square, merge into Stuart Street eastbound. Stay straight at lights at Dartmouth Street. As you approach the second set of lights turn right onto Clarendon Street. The main entrance is located on the right.